Improving how it works, and bringing it to the Mac is something under consideration for a future release. Sounds great, do you think it will be ported to lightroom as well? Bob, what would be really useful for lightrrom is to be able to recognize similar/duplicate images based on image content. I have been using lightroom for years and have thousands of photos, many are different file versions of the same image,i.e. Original Jpg, then DMG version or .tif or .psd version or CR2 version. I have been scanning a lot of historic famiily photos (usually as .jpg or .tiff). This has lead, despite my best efforts for many versions being distributed across my computer hard drives and included in the catelogue. My challange is to whittle down to one image each, with detailed kewords and captions. I then plan to export all as a DMG library. The Lightroom duplicate plugin is very limited as it largely uses EXIF data which is largely missing in Scanned jpgs and does not seem to allow a mix of file types. The old software Iview used to do this and was a very useful DAM tool until Microsoft bought it out then progressively killed it. A good example of how not to be a customer focussed company, take soemthing of value and then kill it. Please make this development a priority for Lightroom (next release please) as the program is screaming out for this capability. d) interesting color moods and their contexts. In the case of searching/sorting for/by colors, Bridge would also offer some sliders for the color proportion(colored area) of main colors, the lightness and saturation. b) you could also move the orange slider to get more orange (larger area) compared to green and violet. Bridge would instantly display the same green/orange/violet but prefer those pictures where the orange dominates. c) the same for other colors, lightness and saturation... as soon as we move the slider, Bridge would change the results. Sorting by COLOR and GRAPHICAL SIMILARITY. 1. Imagine Bridge would offer a little area for drawing. 2. Simple drawings we produce there, would be considered as reference for the visual similarity search. Sample: a simple larger circle we draw, would stimulate Brigde to search for round things like e.g. our Earth or other images containing large spherical/circular elements. The same for a simple diagonal line which would start a search for a similar composition... and so on. The more exact the drawing is, the better the search focus. But in the most cases simple drawings - a few lines - would be already good enough. BRIDGE: a further improvement would be of course a kind of people recognition. Face recognition hence people identification would be also nice, but already the simple recognition of humans would help. Visipics and Duplicate image finder work for jpegs. Doesn't help with adobe photoshop raw. It would be great that when two images were duplicates compared. Areas that were different ex. eyes closed versus open in each photo were highlighted with a blue mask. (Similar to when areas are over-exposed). Even better if you could automatically search for bracketed images. And there were 2 functions concerning "find similar pictures". a) With a slider you are able to define the 'similarity' and the software finds similar pictures. Regardles of crop or (some) modification of the picture. If same pictures are in different folders: you can find them and delete the duplicated. b) you can define a picture and find similar other pictures. I think this can be used if you have a picture and want to find the other pictures of the shooting. Or pictures with similar look. If Lightroom can do the same, i do not need Thumbs Plus. I try to add sceenshoots from my german Thumbs Plus version. Lightroom: is there a chance for 'search and find similar pictures'?. The daily work with thousands of images is VERY BAD in Bridge without an image similarity search. 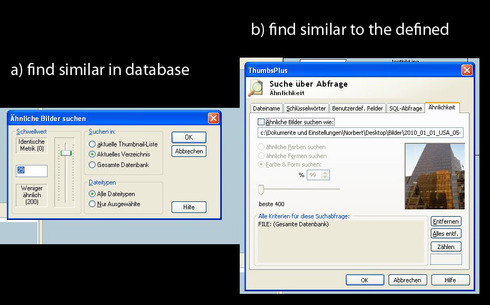 In addition to my other similarity suggestions, I would like to propose two further advanced similarity search features with a huge potential. 1. The ability to select an image and not only find similar images, but find even such pictures, which contain it as pattern. Sample: you would have a portrait and be able to find even groups of people where one of them looks similar to your portrait. 2. Imagine we would can mark a part of an image (directly in Bridge), and be able to search for images which are only similar to this part and not to the whole original image. Sample: imagine your photo contains a butterfly but 70% of your picture displays something else, e.g. a lot of branches and leafs. A common similarity search would just find flowers, bushes, forests and things like that. But you would want to find butterflies! The solution would be to roughly manually mark/select a smaller area which only contains your butterfly and start a similarity search only for this. A more advanced feature would even allow non rectangular selections, hence we would be able to improve the search if needed using a lasso similar selector. A special kind of problem occurs, when we find many versions of the same picture and they use different keywords. I suggest to offer us the possibility to choose one of the versions, as the image we want to keep and to offer an automated merging for the keywords. More exact: Bridge would delete the other versions but to the same time add their keywords to the picture we want to keep. Of course an every user would can customize such things in the preferences. It is good to know that Adobe is working on that, the video was quite interesting and the feature it describes very useful. What I didn't see there and also not in other demos, is searching/sorting images by color. One way would be to give us slider for three or five main colors we could adjust to influence the search results. The slider would adjust the proportions, something like 20% red, 35%yellow .... and so on. A further way would be more sophisticated and allow to find even color harmonies. It would be a little bit similar to Kuler. We would play with that, while Bridge would permanently find corresponding harmonies in our database. Photoshop Elements 10 added three new features in this area. Go to http://www.adobe.com/products/photosh... and click on the "Find Photos That Contain Specific Objects" link for an overview. Any plan for lightroom? it would be so great there as well. Yes Bob, the Elements video is very interesting too, Adobe seems to be on the right way. Of course I hope that these and further similarity features will also be introduced in Bridge, which would be available for all people using the CS. We use tons of images of all types. Exploring them using similarity features would be a fantastic help for all of us! Bridge: find images by composition or content shape. This belongs to the same principle of similarity search, because Bridge would also compare pictures. The fact that we create one of the pictures is secondary. As I already suggested, it would be great to be able to find images, even if we don't know any names or already have similar pictures. We would draw simple sketches to help Bridge to find the right things. This wouldn't be only interesting, if we are searching for a specific image, but also in cases we want to find further samples for a needed kind of composition, or if words and similar images aren't helpful enough. We would be able to find: specific images, specific compositions, specific shapes or objects. The next picture is a sample on how to increase the chance to find an object, in this case a sculpture, when you don't know its name, also not the name of the sculptor and you aren't able to find any useful terms or keywords. The fact that you remember a little how it looks, could already be a great help if Bridge would support this kind of search. It would be very interesting, when Bridge would be able to use even visual patterns for our smart collections. And even more than that, it would learn from the images in the collection. Just imagine we would have a collection specialized on drawings. Bridge would learn from it what kinds of textures and color we classified as drawing until now and enlarge or refine its search using this information. Of course it would give us the chance to correct its results and learn again from that. Agree. Please add some features from Bridge Element to Bridge CS6, include face recognition, visual search, etc. Thank you. They provide also a Free duplicate file finder. This reply was created from a merged topic originally titled Lightroom: Ability to select similar images based on the histogram.. It would be beneficial if there was a function that would allow you to select similar photos by comparing the histograms of the photos. There would need to be a tolerance setting to be able to dial up or down the "fuzziness"
This reply was created from a merged topic originally titled Lightroom feature request: search using image. Many of my images in Lightroom have been uploaded to social media. Sometimes I want to find the original file in Lightroom. Let me find the original by selecting an image file on my hard drive. Lightroom would load this image and use image matchnig algorithms to find the original in a catalog. I'm currently cleaning up a number of duplicate files I have on my computer outside of lightroom using DupeGuru PE because Lightroom doesn't support this. Many of these files come from clumsy backups where I saved all the photos from my phone-at-the-time to my computer to protect them in case my phone were to die. Finding visually similar photos would be wonderful. When duplicates are found there should be compare/survey views showing the images as well as a configurable set of metadata. I usually want to keep the photo with face tags and keywords for example. Seven years on and we have Facial recognition which is handy for sorting family photos and genealogy etc. It doesn't seem a big step from there to have a 'Find Similar' feature for the whole image. More exciting would be to find photo's of the same location by recognising features. I wonder if labelling a feature as a 'face' would work. Will try it out.